Last year I started researching into the Windows kernel to get a better understanding of privilege escalation vulnerabilities. Vulnerabilities in the kernel are a serious issue as they could be used to bypass browsers sandboxes and end up compromising the entire system. In general most people assume that security products are developed with security in mind and can be trusted, so I thought I would start my assessment on security products and see how secure they really are from kernel attacks. Within a couple of months of research six vulnerabilities had already been discovered in various products from different vendors. What was particularly interesting is that they all exhibited the same type of vulnerability, which only seemed to exist on older operating systems. This blog post details the technical research carried out in order to pinpoint the root cause as to what had changed from Windows XP and Windows Server 2003 to later Windows operating systems. 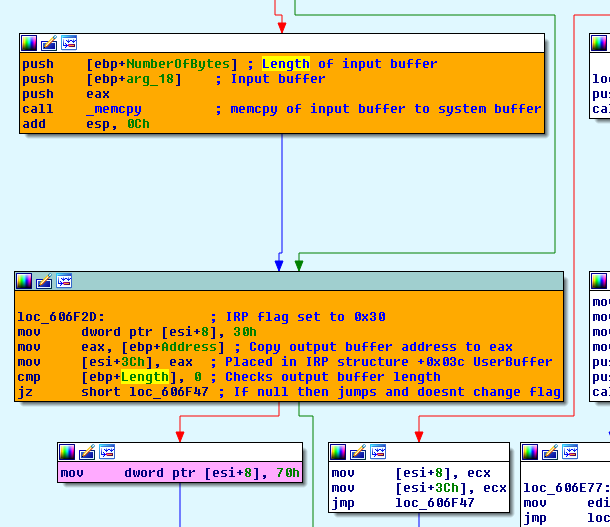 The vulnerability exists when drivers do not validate the output buffer address and output buffer size. Applications wanting to talk to the kernel communicate through the use of the DeviceIOControl function. In this example we can see two things of interest, first is that using LPVOID we can send in a hardcoded output buffer address and second is the output buffer length has been defined to 0. Sending this to a vulnerable driver will trigger a bugcheck. Arg2: 00000001, value 0 = read operation, 1 = write operation. 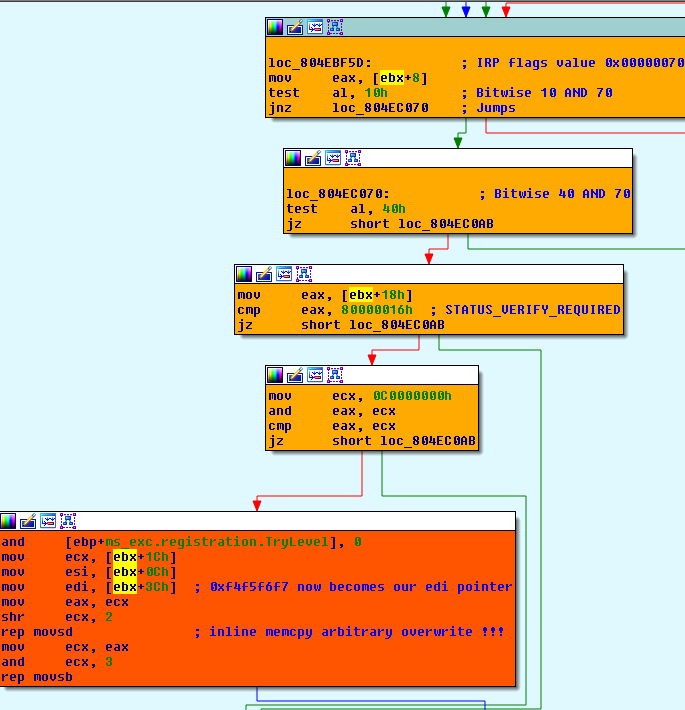 Reverse engineering the driver the bugcheck is triggered after the call of the function IofCompleteRequest. The IoCompleteRequest function indicates that the driver has completed all processing for a given IRP and is returning the IRP back to the I/O manager. IRP is an I/O request packet and is how Windows communicates with drivers. The IRP data structure contains information used by drivers. The exported function IoCompleteRequest in ntoskrnl.exe ends up calling IopCompleteRequest function. We can see on Windows XP that it does a bitwise 40 AND 70 and jumps to the inlined memcpy code which ends up triggering the bugcheck. On Windows 7 we see the bitwise 40 AND 30 takes a different codepath and never hits our memcpy. The “test al, 40h” instruction on Windows 7 branches off to another codepath as its doing a bitwise 40 AND 30 instead of bitwise 40 AND 70 as al=30h on Windows 7 which is from the IRP flags value. “So what causes the flags value to be 30h instead of 70h?” was my next question. After some investigation I discovered that IopXxxControlFile held the answer. 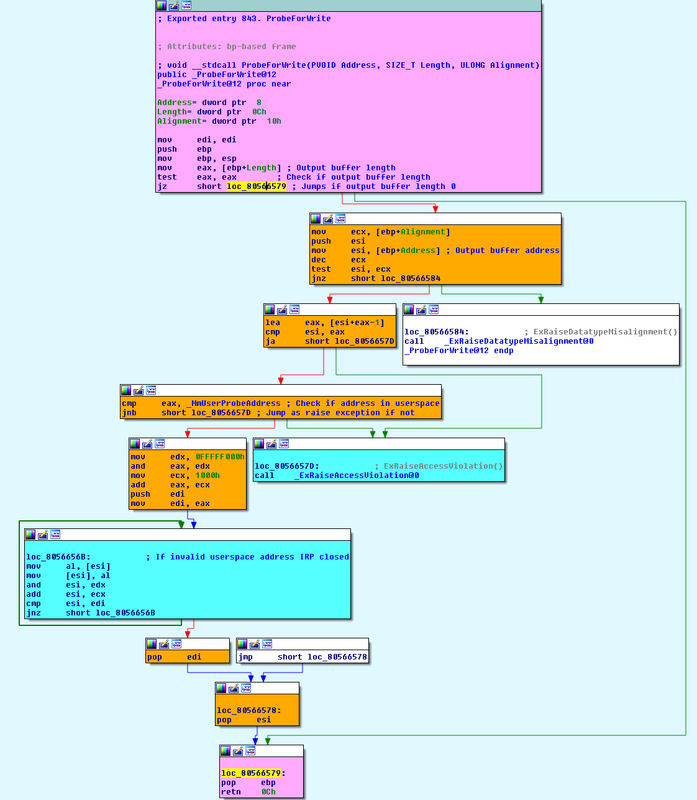 The IopXxxControlFile function had been called earlier in our call stack. This function does a number of checks and validations on the inputs provided such as if addresses are in user space, buffer lengths, etc. and sets up our data in IRP. In this function near the beginning it calls the ProbeForWrite function which checks if the address falls in the user space range and writable. The first thing the function does though is check the output buffer length, if zero it returns back to the IopXxxControlFile function without even checking the output buffer address. The ProbeForWrite function below is from Windows XP but is also the same for Windows 7. 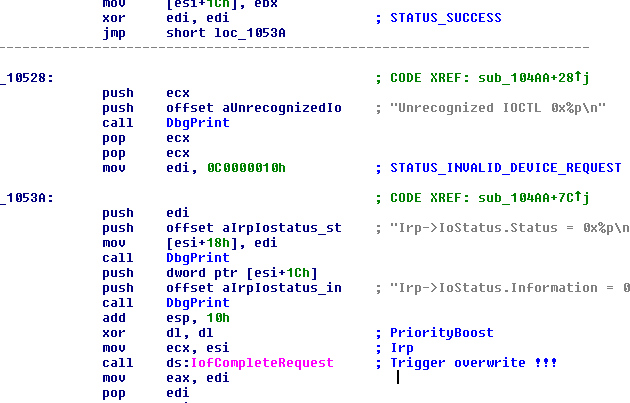 Returning back to the IopXxxControlFile function and after a number of checks near the end of the code we see our output buffer address being placed in the IRP UserBuffer field and Flags value being updated to 0x70, all it checks on Windows XP if an output buffer address is available. On Windows 7 we finally discover the root cause as to what has changed in the IopXxxControlFile function. It checks the output buffer length instead of the output buffer address. 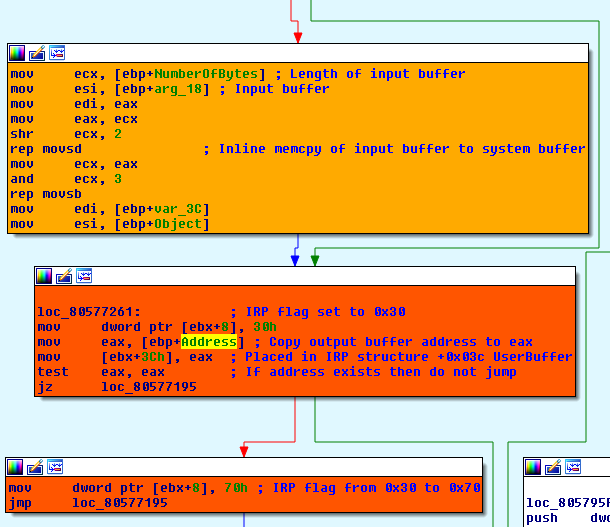 Since the output buffer length is 0 the flags value does not get set to 0x70 thus mitigating the vulnerability. What do these flags values mean? Here is it does its bitwise AND operation and dictates its outcome, jump or not to jump. During completion of an IRP the I/O Manager copies the data from the system buffer back to the user’s output buffer if using Buffered I/O method (METHOD_BUFFERED) and the status is of a success or warning. The number of bytes to copy is taken from the Irp->IoStatus.Information field. In the above code we can see it uses the macro NT_ERROR() to evaluate if not an error status. So if the data is too large for the buffer, the driver completes the IRP with a status STATUS_BUFFER_OVERFLOW (0x80000005), which falls in the warning range, and the Irp->IoStatus.Information will be updated with the buffer size and data copied over. If completed with status STATUS_BUFFER_TOO_SMALL (0xC0000023) which falls in the error range, the I/O Manager does not copy any data back to the output buffer as it sets the Irp->IoStatus.Information to 0. To reproduce a vulnerable driver for testing purposes use this code in your dispatch routine for Buffered I/O. The IoStatus.Information value has to be 1 or more for an overwrite to take place. So when using METHOD_BUFFERED it copies our system data back to our UserBuffer address when IRP is completed using the IoCompleteRequest function. Depending on the dispatch conditions just by changing the status value to an error status is enough to resolve the vulnerability. I would like to thank BullGuard, AVG and K7 Computing for kindly sharing information. A special thanks to BullGuard as they were very helpful and provided a lot more important information which saved me a lot of time on this research. I can’t say the same for the other three vendors: McAfee, Symantec and TrendMicro. All three decided not to share anything; do you see anything confidential in the above code? This table below provides information on the products where this vulnerability had been discovered. Advisories published by some vendors were very unprofessional. Trend Micro had to be advised to correct their description, as they didn’t get it right the first time since it had a number of mistakes and was initially published without consultation. Also the fix applies all the way to Trend Titanium products 2015, which was stated in my vulnerability report but not mentioned in their advisory. For Symantec, well they are not any better. After waiting nearly two months they ended up releasing an advisory advising only to uninstall the driver. Also, their advisory link in their mitigation information section refers to a knowledge base article DOC7993 on how to remove the driver. However, if you take a look as this article it starts off mentioning the MQAC.sys driver and points to a Microsoft link. I had this flagged at the time but no action has been taken. It’s a similar vulnerability so they must have just copied and pasted it without reading it. What is really shocking is that McAfee took 99 days to release an advisory to the public whereas BullGuard took only 16 days. Does that mean if an exploit was made public we would have had to wait 99 days for an update? Also, McAfee failed to mention in their advisory that it also affects Windows Server 2003, which was clearly stated in my vulnerability report as the product is supported on Windows Server 2003. I however did not test it on Windows Server 2003 R2 (32bit) but did reverse engineer ntoskrnl.exe from Windows Server 2003 R2 (64bit) and did have only the address check in the IopXxxControlFile function. There is a 64bit version for McAfee DLP so should be exploitable too. Assessment carried out on some of the security vendors’ products that were not affected from this type of vulnerability are listed below. This is no way an assurance that their products are free from this vulnerability, as there is a possibility some ioctls may have been missed, input buffer sizes may have changed the codepath, device handles not loaded, etc. Since all my tests were on a fully patched Windows XP SP3 32bit and Windows 7 SP1 32bit I thought I’d check some other operating systems. Checking on Windows Server 2003 SP2 Standard Edition 32bit found to have the same issue as Windows XP and during tests exploited successfully. Windows Server 2003 has still got over 5 months before the end-of-life so for those of you still using Windows 2003 better upgrade to a later operating system if you’ve not already done so. On a clean default installation of Windows Vista 32bit in an unpatched state the output buffer length check had been applied like Windows 7. This means Microsoft did know about this issue and added the check before release. There are plenty of products designed only to run on Windows Servers, which I have not audited, so maybe it’s a good time for researchers to discover some low-hanging fruit. One thing is clear from this research and working with vendors: Just because it’s a big company doesn’t mean you’ll get great service. There are plenty of other vendors doing an excellent job so we should not blindly need to go with the likes of McAfee, Symantec or Trend Micro. Updating machines is a tedious job at times so really we should be focusing on mitigation products like Microsoft EMET and MalwareBytes Anti-Exploit and not be so dependent on constantly updating machines for security. Bottom line is to upgrade to the latest operating systems as it will have a number of mitigations, checks, validations in place that we probably don’t even know about yet keeping us safe. I’ll start submitting the exploits to Exploit-DB in the next few days and tweet you all once published. When using buffered method, the IOManager do these checks for you on behalf… You will get an error if you call deviceIoControl for a buffered method IOCTL with an output buffer with that address. This is what most think that IRP->UserBuffer is only used by NEITHER I/O method which is not true. BUFFERED method does do some checks as I’ve explained as you can see the lack of size validation in older OS’s bypasses the address validation. So using BUFFERED method you can write to the output userbuffer.